THEY reckon you can’t judge a book by its cover, but there are bikes that can be judged by their design. And that’s the case with the Aprilia RSV4 RR, which looks every bit the track weapon it is. For starters, even the tail section looks like it could be something left over from a military stealth UAV program. 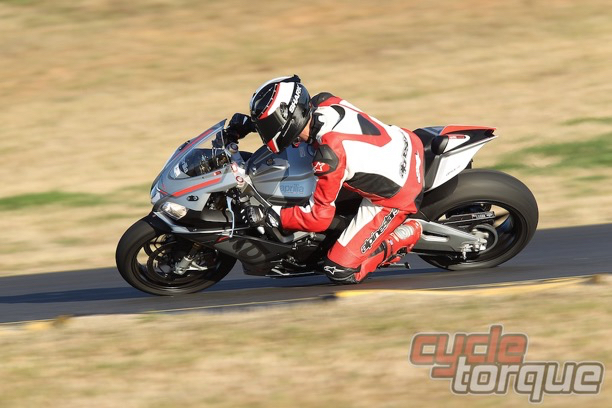 When the original RSV4 made its debut six years ago it was impressive enough, but the 2015 RR model is one of the tastiest machines I have laid my eyes on. But I shouldn’t be so shallow…it’s not all about looks. Sportsbikes are great for two things. Riding at the racetrack and posing down the street. Both are as important as each other, but let’s start with the track. 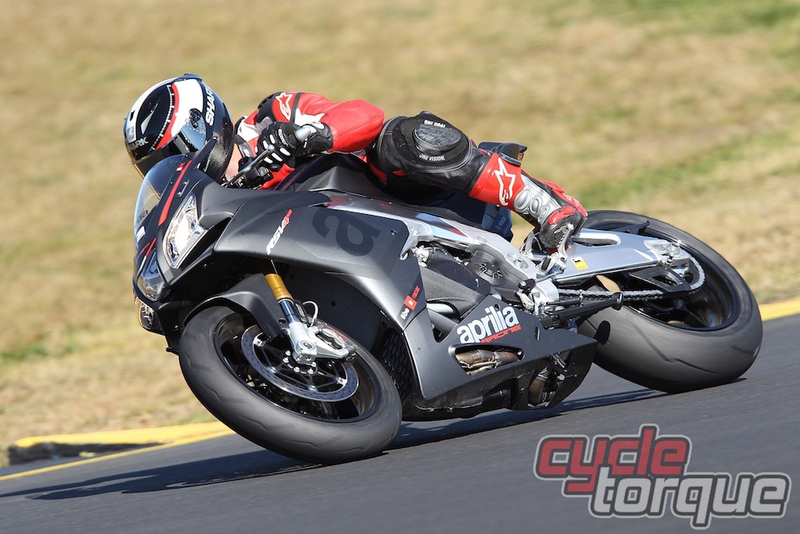 I was lucky enough to sample the RSV4 RR in its natural surroundings – Sydney Motorsport Park. 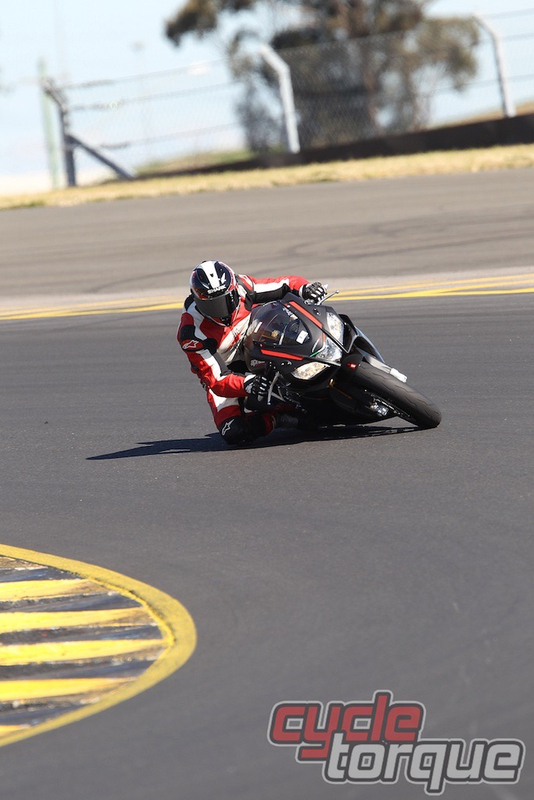 I shouldn’t get ahead of myself, but if you’re familiar with the Eastern Creek layout, you would know that after the tightish turn nine there is a short squirt leading into turn 10. So here I was, high-fiving myself for getting my best run of the day out of turn nine and whooshka, where the freaking hell did turn 10 come from???!! Yes, it requires that many exclamation marks because I then had to pull off some Lukey Luke-esque moves over the grass (which the famed stuntman himself congratulated me on later) but it just goes to show, give someone 200hp and corners can come up mighty fast! The engine is rated at just over 200hp for this bike and I was struck at how compact the chassis was. How do they fit something so powerful into such a little package? Simply starting the bike put me in my happy place. I think there should be a law that makes standard motorcycle exhausts illegal – but this is an exception to the rule, possessing a commanding, authoritative growl. It’s a rare thing to hear (and feel) a standard system so good, and kinda funny just watching the smiles on faces when it snaps into life. But I digress… I didn’t want to start by talking about engines and power. Obviously, 200hp is still kind of a big deal, but the first thing I took notice of was the front end. This was as planted and stable as any front end I have experienced, the feedback from the tyres and chassis encouraged me to keep on pushing – and that didn’t change throughout the entire 40 minutes I spent on track with the bike. As your typical track day hack I thrive on front end confidence and I had that in bucket loads. The 43mm Sachs forks felt solid from the first corner, but the interesting thing I found was that I could really distinguish between the type of feedback I was getting. On this bike, compression and rebound rates felt easy to identify (both front and rear) – it wasn’t a general handling feel, it was specific. In the braking zones (especially in the tight turn 2) I could really set myself up and test out the stopping power of the Brembo monoblocs. 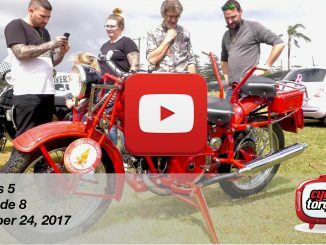 They offered sublime feel as you would expect – with no fade (and these bikes were getting hammered all day). I’ve been impressed by electronics ever since the Commodore 64…but the computerised brain of this bike is something special. Take the anti-wheelie control for example. I had it on the recommended, least harsh, ‘1’ setting and it was a gentle return to Earth every time. You can imagine with the kind of power and torque available in most modern sportsbikes the front wheel does want to rise, which can be both annoying and fun. But if the computer is going to be in control instead of my right hand or foot, it needs to be spot on, and I thought it was. Traction control was also a winner for me – as I said I like a planted front but when the rear moves, it’s good to know the electronics have the situation in hand. When traction broke (I was on the middle ‘3’ setting) it was a consistent movement…once again, nothing violent – back it came nice and smooth. The electronic era is well and truly here, it is no longer MotoGP commentators going on and on about high powered bikes being ‘unrideable’ without electronics – this is now a reality for anyone who buys a modern sportsbike. It’s riding bikes like this that encourage me to embrace the technology, because it makes the experience so much better. I’m no different than the average track day rider, and I think it is just remarkable I can be given so much control over a 200hp engine. After my first session I was having a chat with the Aprilia mechanic, Marco. I explained to him that I felt like the engine ‘ran on’ a little and it would be nice to have some more engine braking. So he dialled it up, and there it was. Marco explained the normal characteristic of the bike is to feel more like a two-stroke (hence the run-on feeling). Ironically, this is a feeling I loved in my younger days on a 2-stroke 250 – late braking, light weight and downshifting at will. For many people, those days are long gone…so I opted for something a little more familiar. The engine mapping has three settings – Race, Track and Sport. The interesting thing here is that there is no horsepower adjustment, it all comes down to the engine braking characteristics. I thought that was a pretty cool idea – as confidence increases you could reduce engine braking and carry more corner speed. This works in with the rest of the electronics that sense real wheel hop on downshift. Speaking of the electronic controls, it was really easy to adjust any of the parameters. The setting for traction control has two large dedicated buttons on the left handlebar and they can be adjusted at virtually any time. The ABS is, of course, adjustable and unobtrusive on the setting I used – it’s dialled right back for track use. The aero qualities proved that the Italian good looks provide function as well as form. Even though the bike is compact, it is easy to tuck in on the long Eastern Creek straight (I’m 182cm tall) – with the RSV4 RR cracking through just below 300km/h each time. Crack being the operative word here…if the exhaust note is distinctive and growling at idle, you should hear it at full noise. Just amazing. Driving out of the last turn is an incredible sensation – knowing I could just hold the throttle open and let the quick shifter work through the gears. The seat felt reasonably high to me which put me in a good position to move around, but it is firm. Great on the racetrack but it would mean more hot choccie stops on the highway. Also worth noting is that on the dash you can select ‘Race’ display mode, where the speedo doesn’t show and you can easily access the common settings you might want to change at the race track. This bike has so many positives it feels like a crime to detract anything from its beauty. All I would say is prepare for the addiction – this is the proverbial ‘surgeon’s scalpel’. At the push of a button you have the power to set the bike’s parameters around your own style. Make no mistake, the RSV4 RR is an intense experience, but the level of customisation available isn’t daunting either, it’s completely practical and encourages speed. It’s the kind of bike my 18-year-old self dreamed of. The components are so precise I think it would be awesome fun to spend some quality time to actually test out all the feedback I was getting and dial in the settings. It’s great getting to test ride this bike but I hate having to hand it back.